More times than I can remember I have been asked for some ideas that would work well for a Ladies Bible study. Here are just one half dozen great ideas for you in no particular order. This is a free resource from Bible.org. In summary, the study centers around the idea that “Just as popular songs today often put words and music around our life experience, so the Psalms are “songs for the soul.” Psalms are poems intended to be sung. Psalms are music without the notes. The tunes are lost to us, but God has preserved the lyrics, perhaps in His own purposes, so that all generations and all cultures can set them to their own music. Sing their own songs.” You can download this resource from Songs for the Soul. This is another online and downloadable free resource. Melanie says this about the study: “This 11-lesson grace-based Bible study covers the essentials of living a Christian life. Discover who Christ is, what He has done for us on the cross, what His resurrection means for us, and our new identity and way of living in Him—a life of freedom and joy! A very nice study complete with homework! Free resources at her website. Gigi says this about this one: “The study, “God Loves You and Me,” consists of 8 written lessons and an epilogue. Each lesson is designed for you to do in a week’s time. (The women who did the unedited version took 2 weeks per lesson.) Each of the 8 lessons has five, one day sections in it. The study can be done alone or in a group setting. The study also has 9 audio devotions that fit with each written lesson, except for devotion 0. Devotion 0 is an introductory audio devotion for the Bible study. It has no written study to it. Its purpose is to get you started thinking and understanding how much God loves and values you. Help add to the list. 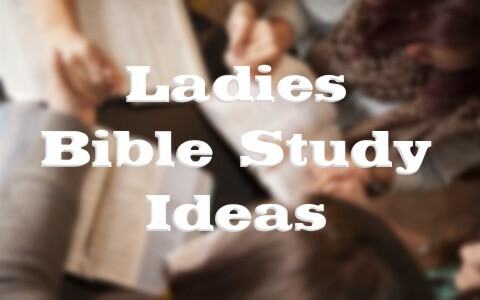 Give us some of your own ideas for Ladies Bible Studies in the comments below. Previous post: How Can You Know Whether It’s God or Satan Speaking To You? Next post: How Can We Renew Our Minds?